Eastern Electrics Festival’s DogEE Club recruits D Double E, Skream, Bradley Gunn Raver and more for walkies. PLUS, Hot Since 82 and Chris Lorenzo join Saturday line-up! Eastern Electrics proudly present the DogEE Club! With the sun finally coming out, we hit the pub and the park with Eastern Electrics All-Stars, and their best fluffy friends! Recruited for walkies, Skream, D Double E, Bradley Gunn Raver, Sam Divine, Royal T and Citizenn introduced us to their pooch pals, telling stories of raving and more. Whether it’s grime and garage or house and techno, our pups love to party. Watch the film to hear how EE’s superstar DJs met their masters, and for a taste of the mischief that’s to come at this year’s all out weekender in Morden Park. Join our artists and their canine companions this summer 4-5 August, in leafy Morden Park. Tickets here: https://bit.ly/2mGCJFC. 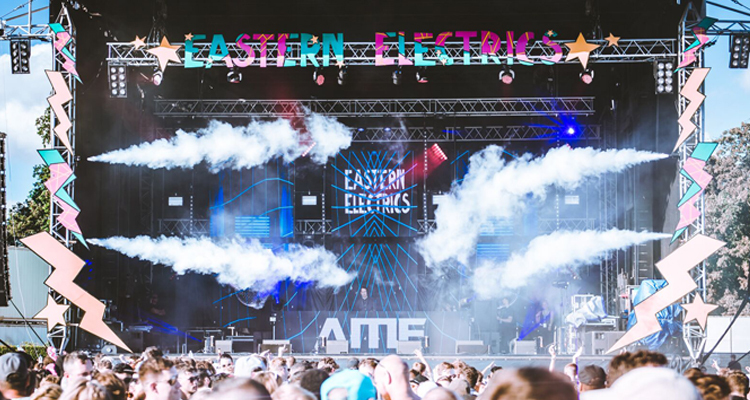 This August, Eastern Electrics Festival extends the party, rolling into full weekend affair from Saturday 4th and Sunday 5th August at Morden Park. In true EE style, it’s house, techno, and big room bangers on Saturday. With an already MAMMOTH Saturday line-up, EE are excited to announce the return of Hot Since 82. Following an unforgettable set in the industrial Switchyard last year, the legend steps up to the Main Stage for 2018. Another unmissable addition, Chris Lorenzo makes his Eastern Electrics debut this August, laying down bangers for TQD’s takeover. With seven massive stages, there’s something for everyone. There’s guaranteed vibes from the Main Stage with Jamie Jones, Patrick Topping and more. Skream brings friends and fam to his RC1 poweredSkreamizm stage – hands in the air for Dennis Ferrer, Elrow mainstays De La Swing.Catch Defected in the House all stars including Sam Divine, Riva Starr and Amine Edge and Dance. For grime heads, TQD stage is a no brainer with D Double, Conducta among the line up, while Prince Fatty and Horseman head up Electric City’s eclectic showcase. Last but certainly not least, Ministry of Sound are on hand to treat you right with VIP action from Nathan Barato, Waifs and Strays, Kate Simko to name a few. Grab tickets here: https://bit.ly/2mGCJFC. Then, it’s a Bass-laced Sunday session offering up the best in reggae, DnB, grime, hip hop, garage, bass and beyond. Catch soundclash legend, David Rodigan, marking 40 years in the game, and d’n’b pioneers RAM Records with Bad Company, Culture Shockand more in tow. Hark back to the pirate radio days with RINSE FM – bringing sounds old and new from the likes of Spooky b2b Grandmixxer, Ghetts and 67, stepping up to the main stage. Don’t miss a dancefloor education with Matt Jam Lamont’s History of Garage and Bass hosting Wookie, Scott Garcia, Oxide and Neutrino and many more. South London Soul Train’s signature boogie-wonderland heads alfresco with live sets galore from the Lazy Habits, The Bongolian and Dr Meaker to name but a few. Finally, So Fresh So Clean bring hip-hop, house to the VIPs. All this and more to come – keep your eyes peeled for two MASSIVE unannounced guests for Day Two. Sunday tickets are starting at the unbeatable price of £20 + BF, weekend tickets are also selling fast at £57.50 + BF don’t sleep on this 2018 sees Eastern Electrics spreading it’s wings into a two day soiree, extending the party even further! EE has become a staple festival for London’s clubbing scene. With fairground rides, street food, glitter, cocktails and much more, set in the idyllic settings of Morden Park – its the ultimate spot for fun, frolics and epic music in the sun! Weekend tickets are running from selling fast at £57.50 + BF, Saturday Tickets from £45 and Sunday from £20 – grab a ticket now to secure your place at what will be a weekender to remember.https://bit.ly/2mGCJFC. Ghetts – Cassisdead – 67 – Murlo b2b Conducta – Suspect – Young T and Bugsey – Spooky b2b Grandmixxer – Sam Supplier – A.G.